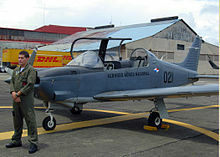 The Chilean Air Force (Spanish: Fuerza Aérea de Chile, FACh) is the air force of Chile, a branch of the Chilean military. The first step towards the current FACh was taken by Teniente Coronel Pedro Pablo Dartnell, when he founded the Servicio de Aviación Militar de Chile (Military Aviation Service of Chile) on December 20, 1910, being trained as a pilot in France. Although a local academy was created, the first officers were sent to France for their training as well. One of them, Captain Manuel Ávalos Prado, took command over the Chilean military aviation school, which was officially established in February 1913, and remained in command until 1915. The Escuela de Aviación Militar (Military Aviation School) was named in honor of him in 1944, and still carries that name today. In those early years many aviation milestones were achieved; conquering the height of the Andes was one of the main targets as well as long distance flights. Typical aircraft of that era were Avro 504, Bleriot XI, Bristol M.1C, DH.9, and SE5a. In the following decade, the (Airmail Line of Chile) Línea Aeropostal de Chile was created on 5 March 1929 as a branch of the military aviation. This postal airline later developed into the airline Línea Aérea Nacional (National Airline) that is still the leading airline in Chile today. 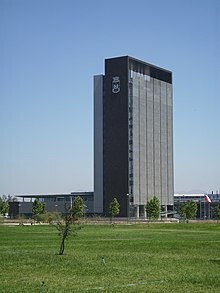 Shortly afterwards, on 21 March 1930, the existing aviation elements of the army and navy were amalgamated into a dedicated department: the Subsecretaria de Aviación (Department of the Air Force) effectively creating the current independent Air Force. It was initially named Fuerza Aérea Nacional (National Air Force). The international airport of Chile carries the name of Lan's founding father and first commander of the air force, Air Commodore Arturo Merino Benítez. Its baptism of fire was in the 1931 sailors' rebellion in Coquimbo, where Air Force attack aircraft and bombers and 2 transport planes converted into bombers contributed to its failure. The first outlines of the organization of the current air force were visible in 1945 with the inception of Grupo de Transporte No.1 (First Transport Group), later renumbered Grupo 10, with two C-45s and a single T-6 Texan at Los Cerrillos. Two years later the first Fuerza Aérea flight to Antarctica was performed. The fifties meant entry into the jet age for the FACh, and Grupo 7 was the first unit to receive them in 1954. Chile got its aircraft from both the United States and Europe. The American supply consisted of Lockheed F-80, Lockheed T-33, Beech T-34 Mentor, Cessna T-37, Cessna A-37 Dragonfly and Northrop F-5E/F for example, whereas the British supplied Hawker Hunters and the French delivered various helicopters and Dassault Mirage 50 aircraft. During the military coup d'état on September 11, 1973, the Chilean Air Force bombarded the palace at the request of the Chilean Army. The Chilean air force hosted the joint exercise Salitre with other friendly nations in 2014. It also participated in several United Nations peacekeeping missions overseas in 5 occasions. Aviation School "Captain Manuel Ávalos Prado"
Air Specialties School "Flight Sergeant Adolfo Menadier Rojas"
The Chilean government has signed letter of intent to purchase six Embraer KC-390 tanker/transport aircraft. Chile also maintains its own aviation industry, ENAER. The design of the T-35 Pillán trainer, based on the Piper PA-28 Dakota, is the best known example, seeing some export success as well. Furthermore, the assembly of the A-36/T-36 Halcón (CASA C-101) was achieved as well. Performing maintenance on most types in the current inventory, such as minor modifications on F-5E aircraft for example, the industry is of significant importance to the air force. ENAER is reported to be in talks with Embraer of Brazil to codesign the first indigenous South American military transport plane. Also, under the Pacer Amstel programme, with initial Dutch support, and later locally ENAER upgraded an F-16 combat jet, which for the Chilean Air Force is an advance for their maintenance of the F-16 fleet (becoming the 5th country to modify their jets under authorization). Chilean Air Force officers wear the following cap badges in their peaked caps. ^ "Chilean Air Force". f-16.net. Archived from the original on 13 March 2015. Retrieved 27 February 2015. ^ a b c d e f g h i j k l m n o p "World Air Forces 2017". Flightglobal Insight. 2017. Archived from the original on 29 July 2017. Retrieved 19 March 2017. ^ "World Air Forces 2011/12". flightglobal insight. Archived from the original on 15 February 2015. Retrieved 16 February 2015. ^ "Chilean Air Force Boeing 767". flightglobal.com. Retrieved 10 February 2015. ^ "Chilean navy considers Hermes 900". flightglobal.com. Archived from the original on 25 January 2015. Retrieved 10 February 2015. ^ "World Air Forces 2015 pg. 13". Flightglobal Insight. 2015. Archived from the original on 24 March 2015. Retrieved 26 December 2014. ^ "How Embraer attracted a global audience to the KC-390". flightglobal.com. Archived from the original on 24 April 2015. Retrieved 10 February 2015. ^ a b c d e f g h i j k Trade Registers Archived 2011-01-31 at WebCite. Armstrade.sipri.org. Retrieved on 2015-02-18. 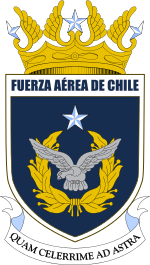 Wikimedia Commons has media related to Fuerza Aérea de Chile.